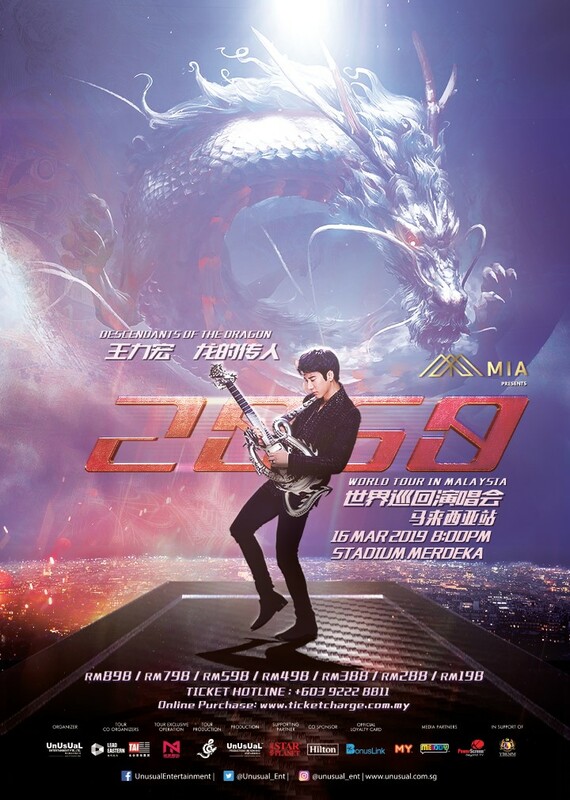 Wang Leehom fans in Malaysia are getting their chance to see the King of Chinese Pop live after all as Leehom will be making his way to the country for his “Descendants of Dragon 2060” World Tour! The concert tour, which kickstarted last year in cities including Beijing, Nanjing Shanghai, Shenzhen, and Singapore, will be coming to Malaysia this March. Ticket sale begins this 19 January (Saturday) from 11am via www.ticketcharge.com.my. Get your hands on the tickets at either RM898 (VVIP), RM798(VIP), RM598(Cat 1), RM498 (Cat 2), RM388 (Cat 3), RM288 (Cat 4) or RM198 (Cat 5) (exclude RM4 processing fee). 10% discount will apply for tickets purchased from 19 to 21 January 2019 for VVIP, VIP, CAT 1, CAT 2 and CAT 3 tickets. Each transaction is limited to 8 tickets only. Another perk for VVIP and VIP ticket holders is 1,000 lucky fans will get to walk away – via lucky draw – with Leehom’s personally autographed concert poster each. Wang Leehom takes his “Descendants of Dragon 2060” World Tour to KL. “Descendants of the Dragon 2060”, handled by the production team from the Grammys, is dubbed as one of the “most highly anticipated tours of recent years” as it uses storylines as clues to depict its repertoire and features cool high-tech techniques that lend it a futuristic touch. Leehom previously explained that the name of his new world tour represents the future of Chinese ethnicity and tradition, transporting his fans to a brave new world of love, peace and equality. The singer releases a brand new version of his hit “Descendants of the Dragon” every 12 years when the Year of the Dragon comes around, as he wishes for the song to live on with different creative arrangements and hopes to sing it until the Dragon year 2060. With 24 years of experience in the music industry, fans can expect to be treated to Leehom’s dynamic fusion of jazz, rock, Chinese opera and blending of Western and Chinese instruments that the singer is renowned for at the concert.